There are several factors which come into play when choosing a cordless phone. Maybe the first I would suggest would be considering he number of handsets you will require. Cordless phones come in a selection of expandable systems from single handset phones, to twin handsets through to trio/ triple handset systems and even quads. These GAP/ DECT phone systems consist of a main base station – which requires a connection to the phone socket as per normal; and satellite additional handsets. These additional handsets can be placed in any are within range of the base station ( commonly 50-100m indoors) and just need a power source to charge the batteries in them. For desktop additional handsets, such as in the office or bedside normal charging stations are suitable, but it is worth considering going for a wall mountable charger, say , for in the kitchen. You will also have to decide whether or not you require a Telephone answer machine built into the base station. Many people enjoy the facility to not only take messages at home but to be able to access them remotely also – via an access code protected method you are able to listen to your messages even when on holiday. Typical home phone answering machines have a recording time of 12-15 minutes, which for a long message of 20 seconds would give you space for maybe 30-50 such messages – ample for most situations. Further consideration maybe given to the style and build of the handsets. Handsets may be sturdy and rugged in appearance or, as with some models be ‘designer phones’, built to look good whilst delivering a great call quality. Designer cordless phones come in many shapes and sizes and, hence, could be chosen to fit in with a great variety of interior decors. Additional features vary from phone to phone, but in general the majority of cordless phones incorporate features such as SIM Card Import, Large Alphanumeric Telephone Directories, Backlit Screen, Colour Screen, Caller Display, Call Transfer, Intercom, Speakerphone and even games on some handsets. The final choice comes down, as with many consumerist acts, to the manufacturer. As a consumer we do build up preferences to the design and operation of models by particular manufacturers. The leading Cordless Home Phone manufacturers for the UK market are Philips, BT Phones, Siemens Gigaset, Magicbox and Panasonic. All these manufacturers produce high specification cordless phones which are fully conforming to European DECT standards. 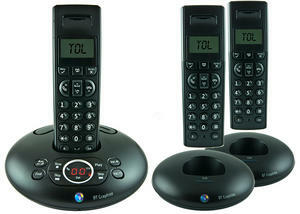 Telephones Online has a large selection of cordless home phones from a variety of manufacturers. Certain models are now also in production which are ‘eco’ models, cutting down on power consumption and hence cutting bills whilst reducing your carbon footprint. To summarise, cordless phones have replaced the old corded phones in most UK households now delivering a freedom of movement and an ease of communication which enhances the way in which we talk to each other.